NASA astronaut Ron Garan looks into the camera from outside the International Space Station in July 2011. "Knocking on the door to come back in #FromSpace after yesterday's spacewalk," Garan wrote on Twitpic. You might think it's cool enough that NASA astronaut Ron Garan has spent months aboard the International Space Station, but he’s become even better-known as a social-media maven. This month he passed the 2 million mark for Google+ circles, putting him at No. 21 on the Google+ Top 100. His Fragile Oasis postings are a highlight on the Web, Facebook and Twitter. His "Ask Me Anything" exchange with Reddit users went so well he's thinking of doing it again. So what's the secret to his success? It's really not a secret at all: He’s got a good story to share, about the beauty and fragility of planet Earth. The 50-year-old New York native is a former Air Force fighter pilot who has degrees in business economics and aerospace engineering. 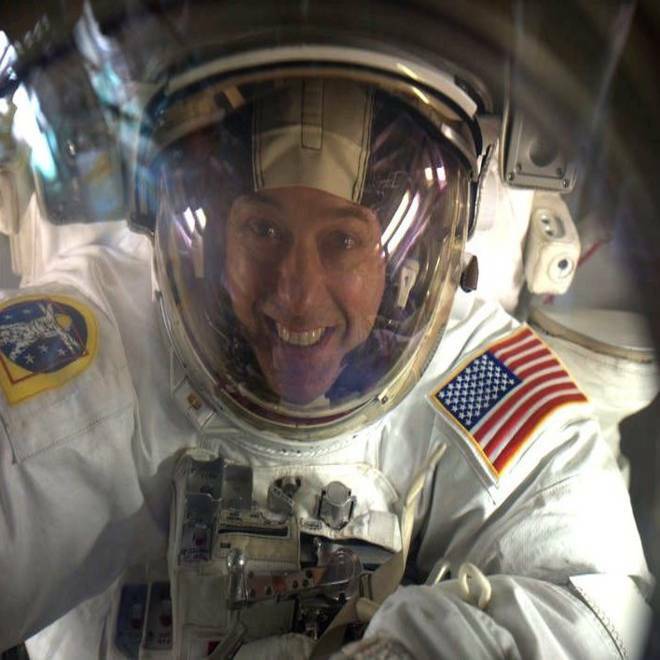 He joined the astronaut corps in 2000, and his training for spaceflight included a turn as an "aquanaut" for NASA's NEEMO underwater research mission in 2006. Garan has been up in space twice — in 2008, on the shuttle Discovery to help deliver Japan's Kibo lab to the International Space Station; and just last year for a nearly six-month tour of duty on the station. Garan says another stint on the space station is "always a possibility, down the road." But right now, he's focusing on NASA's Open Government Initiative, which aims to build stronger collaborative ties between government, industry and the general public. That means social engagement isn't just something he does in his spare time. It's part of his job. Cosmic Log: When you come into contact with the public, what do you find they’re most curious about? Garan: "Well, what they’re most curious about is the basic question of what life is like, living in space. It really is a marvelous experience. It’s very interesting in a lot of respects — and probably the greatest part about it is that it gave me an incredible sense of appreciation for what we have here on our planet. Everything from just simple things that define the beauty of life on our planet — the breeze in your face, and the smell of flowers, watching a flock of birds and a million other things. After you’re up there for a while, those are things that you really start to miss. "I had the opportunity to have a short-duration flight on the space shuttle Discovery back in 2008, during which I was up there for two weeks, and then a long-term one where I was up for five and a half months. And it’s a very different experience. You have the same views, you have the same environment that you live in. But being able to see the earth, day in and day out, and watch the earth change ... and to really start to miss some of the things that I took for granted, that really gives you that appreciation." 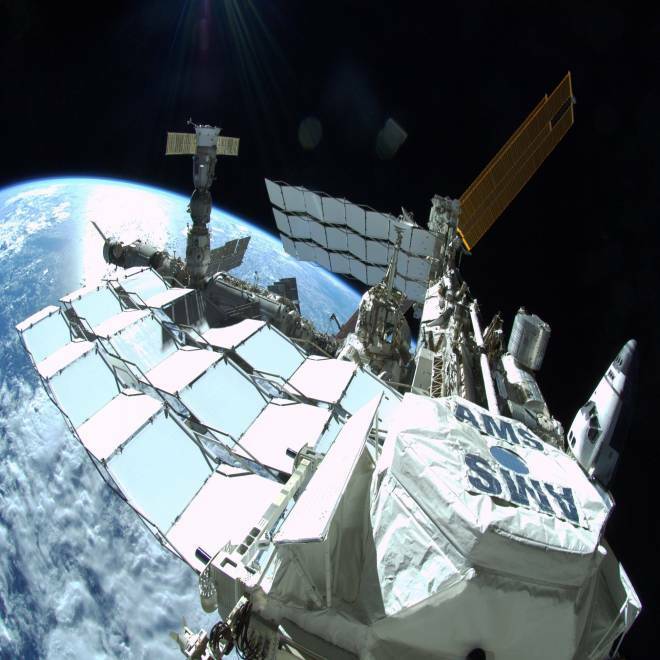 A fish-eye view of the International Space Station, captured by Ron Garan last July, features the Alpha Magnetic Spectrometer in the foreground. A Russian Progress cargo ship and a Soyuz crew capsule are docked on the left end of the station. The structure extending to the left of the AMS is a thermal radiator. One of the station's gold-colored solar arrays is visible in the background. And off to the right, the shuttle Atlantis is docked to the station's Tranquility module. Q: So how did the Fragile Oasis website enter into the mix? A: "That came out of my shuttle mission in 2008. I had a little bit of frustration. I imagine it’s like when you go to the Grand Canyon, and you’re there by yourself, and you sit there at the rim of the Grand Canyon and you’re looking out over this amazing thing. And imagine that very, very few people have been able to have that experience. For me, at least, that would be frustrating, and the experience would not be as rich as it would be if I had the opportunity to share that with people. So I was frustrated during my shuttle mission that I couldn’t share the experience. "When I got assigned to my long-duration mission, there’s two and a half years of training, and during that two and a half years, I really brainstormed how I could do that. We came up with Fragile Oasis, not just to have it as a website where we could tell stories about space, but the goal was always to provide a platform for people to follow along on the mission, not as spectators but as fellow crew members. To have an interactive way to do it. "We had some significant technical challenges in getting that thing off the ground, and it’s still a work in progress. It doesn’t have a lot of the interactive features that we wanted it to have, but we’re working on it. When I launched to the International Space Station, and I had the five and a half months up there, I really was very thankful that I had this tool, this platform, to be able to communicate. And in the meantime, we had the exponential increase in the popularity of social media tools. "First I did Facebook, but I didn't see that as a public outreach tool. I saw that as a way to connect with old friends, and I was just using it on a personal basis. On the other hand, I started Twitter for one reason: I saw it as a way to do education outreach. I could say, I’m learning about this experiment we’re going to be doing in space, and I’d put a link on there to the experiment's website and the science behind it. I saw that as a very powerful way to do outreach. I now see the benefits of outreach in other platforms as well, including Facebook and obviously Google+. In the case of Google+, I see a very robust mechanism to share the space program and the experience of living in space with a lot of interactive features on that platform." Q: With all your experience in social media, do you find that you favor one tool over the other? From your comments, it sounds as if you’re seeing some differentiation in how those different tools can be used. Particularly with Google+, you just recently passed the 2-million-follower mark. That must be one of the big successes for your efforts. A: "Well, I think all the platforms offer slightly different tools to tell the story. I think they all fit together really well, actually. So it’s not a 'one-platform' type of message. We want to reach the broadest audience we can, because the excitement of spaceflight is global. It’s for all humanity. So the more tools we can use to tell that story, and the more people we can get involved with the story, the better off the whole message will be." Q: Did you have to do a selling job with NASA to do the sorts of things you’re doing? A: "It took a while to catch on, but it’s catching on now across the board. We realize the benefit of social media. I’m on some social-media committees now, on some working groups to help not only crew members and astronauts, but also thousands of other people who work in the space program. They have a very compelling story as well. We’re trying to find the best way to get that story out. And what we’re finding is that just letting people tell their story in the way they want to tell it is the best way to do it. "Obviously, there have to be guidelines. But the more leeway we can give people in the space program to tell their story, the richer the experience will be, both for the people who are reading it and for the people who are doing it. That’s one of the cardinal rules here, to give people as much leeway as we possibly can." Q: Are there any guidelines or favorites that you want to pass along to people who want to be closer in touch with the space adventure? A: "Oh, yeah. There are tons and tons of people. Most of the astronauts who fly in space right now have Twitter accounts. They’re all on there. There’s also @NASA_Astronauts, where we try to retweet, as best we can, everything from all the astronauts. There’s @NASA, the official Twitter account. There’s the Facebook version, and soon the Google+ version of all these as well. There’s commercial spaceflight: @SpaceX has a social media presence. There are people outside the space agency who are involved in telling the story as well, such as @YurisNight and #spacetweeps. "What we’re finding through this is that it’s not just the official word from NASA, the European Space Agency and the Japanese space agency. There are citizen scientists and all these other groups that have formed around the idea of space exploration, and they really do a great job of telling the story as well. It’s obvious that there’s a lot of passion and heart and soul that’s put into this." Q: Is there something about the space story that particularly resonates with social media? A: "I think it’s because it’s a human endeavor, and throughout the 50 years of human spaceflight, it’s always been a select few people who have gotten to fly in space, and we’ve relied on them to come back and tell us what it was like. Now, through technology and through these new platforms, we can bring people along with us on the missions and have them experience this is real time. You can see example after example of this. "An easy example is, if one of us sends out a tweet with a picture, let’s say, and we misidentify the geographic location, we’re going to find out about that pretty fast. That happened to me on my mission, and I thanked the person who brought that to my attention. I started sending pictures to that person first, to make sure I got it right. We don’t have a lot of time up there, and all the pictures and all the social media that we do is in our free time. So to have people on the ground, crowdsourcing or open-sourcing or however you want to put it, that really empowers us to do more. It makes communication much more effective." Q: Have you ever thought if it would be possible to boil down the glory of space down into one tweet? Is there any elevator talk you’ve thought about giving in 140 characters, about what it’s like to fly in space? A: "You’d need at least 147 characters to do that ... no. I know I couldn’t do it. That would be a pretty remarkable feat." Q: What’s the one thing that you’d like people to know about spaceflight. Q: Not 140 characters, but what’s the one biggest message that you think the space experience provides for people on Earth? A: "Well, to go back to the reason we started Fragile Oasis: The really compelling reason is that we wanted to use this perspective we have on the planet to inspire people to go out and make a difference, and make the world a better planet. The one gift that I think we get when we fly in space is this perspective. "You don't necessarily have to be in space to get this perspective, but being in space really reinforces it: You see how fragile the planet is. You see how beautiful it is, how peaceful it looks. Then you realize that life is not as beautiful for everybody on the planet as it looks from space. That's a very compelling thing to experience, and hopefully it serves as a call to action, to not accept the status quo and make life on the planet as beautiful as it looks. That's the No. 1 thing that I want to get across." The International Space Station looks like little more than a speck with solar panels in this picture, which was taken from the shuttle Atlantis during its approach on July 10. A first-quarter moon shines on the right side of the frame. 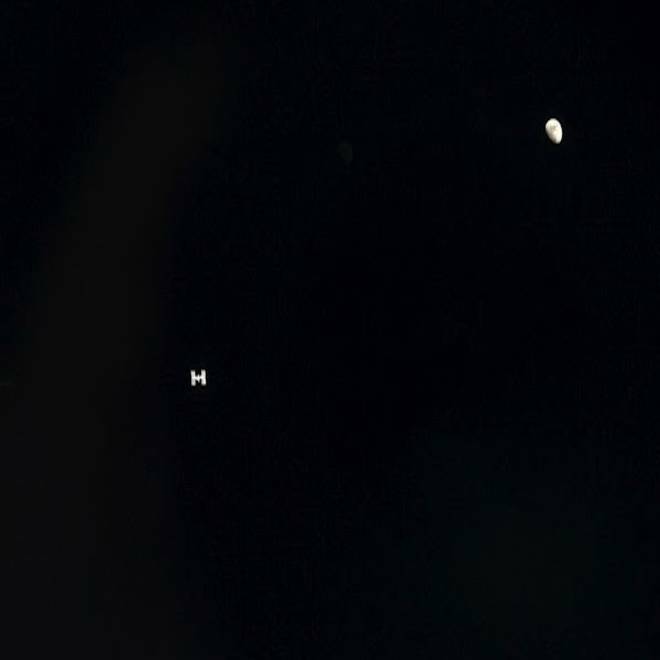 Garan and his colleagues at Fragile Oasis offer a cornucopia of outer-space imagery and blog postings, including this picture of the International Space Station and the moon, as seen from the shuttle Atlantis during its approach for docking last July. The photo served as today's quiz picture in the "Where in the Cosmos" contest, presented weekly on the Cosmic Log Facebook page. Len Whitney's comment was my favorite: "I believe it's a TIE fighter ... but those are short-range fighters, we're too far out in space ... Must have taken off from that moon ... Wait a second ... that's no moon!!!! It's a space station!" For figuring out so quickly that the picture showed a moon and a space station, I'm sending 3-D glasses to Facebook followers Matt Jaworski and Lawrence Johnson. I'm also reserving a pair for Whitney. To make sure you're in on next week's contest, click the "like" button on the Cosmic Log Facebook page and join the alliance. It's not a trap! Although Ron Garan is the highest-rated astronaut on the Google+ list, props also deserve to go out to Mike Massimino, the first NASA astronaut to tweet from space and NASA's top astronaut when it comes to Twitter rankings.